The airport station is at the far end of the terminal building after you come out of the baggage reclaim and customs area. Tickets are available from machines and access is by travelator or elevator down to the platforms. Trains to Copenhagen Central Station ('København H') leave from platform 2 approximately every 10-12 minutes, the journey takes 13 minutes. The fare for a single ticket is 36 DKK. It is a 10 minute walk to ECO from Central Station. You can also change to the S Train and it is just one stop to Vesterport Train Station. It is a 3 minute walk from Vesterport station to the ECO premises. The Metro departs from the Airport every 3 to 6 minutes. The station is reached by escalator at the far end of the arrivals terminal building. The journey takes app. 16 minutes to Forum station. It is approximately a 13 minute walk from Forum station to the ECO premises. You can also take the metro to Nørreport st. and then change to the S Train and it is just one stop to Vesterport Train Station. It is a 3 minute walk from Vesterport station to the ECO premises. The taxi fare from the airport to the ECO premises is approx DKK 300 (EURO 40). The journey takes approximately 15 to 25 minutes, depending on traffic conditions. 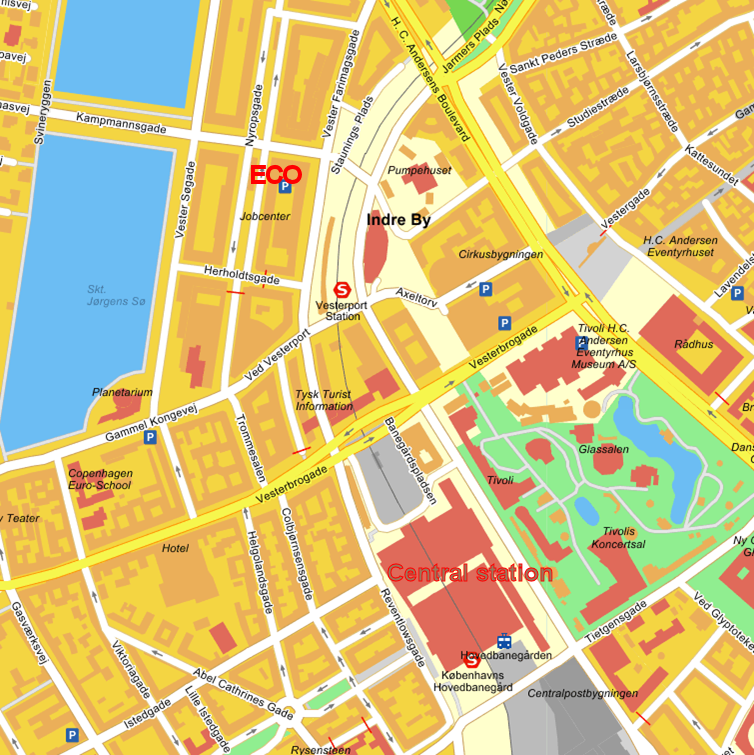 Map link to ECO location incl Forum St.